Neil Young released his 1981 album re-ac-tor as he played with Crazy Horse. Song 5 is "Southern Pacific." "Roll on, Southern Pacific, on your silver rails, in the moonlight." 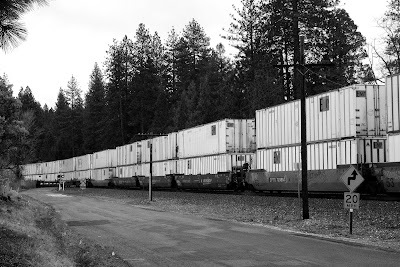 Union Pacific has been running double-stack container trains over Donner Pass since November of 2009. 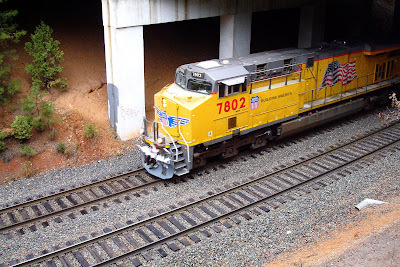 Here, UP's 7802 West is, above, heading downhill on the #1 track at Dutch Flat where the speed limit is 25 mph. On point, 7802 is what UP calls a General Electric C45ACCTE, which means a locomotive with AC-driven traction motors, 4400 hp, with CTE indicating "controlled tractive effort." 7802 is one of 325 such GE units purchased by UP and built between 2007 and 2008. GE refers to this model as the Evolution Series, ES44AC, which possesses the GEVO 12-cylinder diesel engine as prime mover. Fifth photo down, UP 7802 West passes directly under Interstate 80 near Secret Town. On both point photos you can clearly see snow on the pilot. Click to enlarge each photo. Click on the post title for a GE Evolution brochure in PDF. 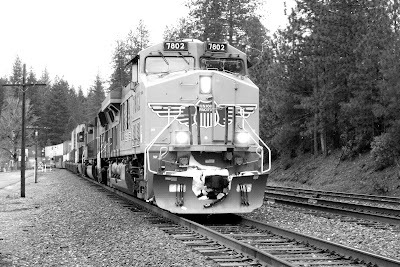 Union Pacific to Double-Track the Donner Pass Route Once Again? At one time the route over Donner Pass was completely double-tracked, from Roseville to Sparks. Portions of this double-tracking were comparatively steep and predominantly reserved for downhill traffic. In fact, the steepest portion of Donner Pass is the original Central Pacific tracking, known now as the #1 track. Work for the #2 (used for eastbound or uphill traffic) track was originally begun in 1909. Seventeen tunnels and two major bridges were added. A second double-tracking project began in 1923. Here, there were seven more tunnels, four steel viaducts and snowsheds added. This project was completed in 1925 and included what railroaders now call the "Big Hole" under Mt. Judah, the 10,322-foot Tunnel 41 -- at the time, the third longest tunnel in the continental United States. By this time the Central Pacific and its creators were long gone. The line now belonged to and was operated by Southern Pacific. Things changed radically, however, when Philip Anschutz purchased Rio Grande Industries in 1984, that being the holding company for the Rio Grande railroad (DRGW: Denver & Rio Grande Western). On August 9 of 1988, the Interstate Commerce Commission approved the purchase of Southern Pacific by Rio Grande Industries, who took control of SP on October 13, 1988. It was at this time, under the reign of Mr Anschutz, that SP continued its decline. Traffic patterns changed in the late 80s and 1990s, which resulted in SP literally ripping up some portions of the double track over Donner. The last train to run over full double-track territory was in 1993. Information indicates this was done partially to provide more rail for the Sunset Route further west, and because the maintenance of the long snowsheds visible from I-80 over Donner Lake was too costly. Perhaps at the time it was a money-saving measure, but remarkably short sighted. Any form of double-track then reduced to a single-track creates all kinds of traffic bottlenecks for both east- and-westbound trains. There have been numerous time since 1993 that SP and then UP wished all the double trackage was still in place. Trains clog up going eastbound at the mouth of Switch 9 and Tunnel 41; trains clog up going westbound just prior to Shed 47 and prior to Shed 10. UP officials say the project is the first of several steps to upgrade the historic corridor, route of the first transcontinental railroad. UP wants to add a second set of tracks in some mountain sections where there currently is only one, and to make changes in the Roseville railyard to move freight more easily there. 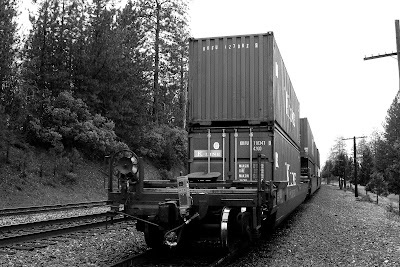 Ironically, the former owner of the line, the old Southern Pacific company, ripped out many double-track sections a quarter century ago as a cost-saving measure when freight rail was on the wane. 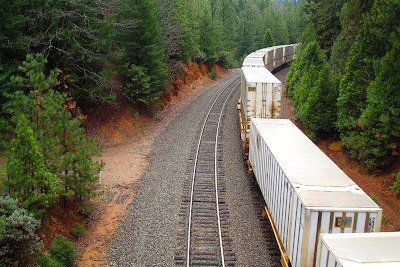 I say: Union Pacific couldn't double-track the Donner route fast enough. NOTE 1: Mr Anschutz, ever the savvy individual, whilst in possession of remarkable trackage right-of-way under Southern Pacific, laid down miles of fiber-optic cable paralleling these tracks over Donner Pass under the name of SP Telecom (later MCI and then Qwest). NOTE 2: What people also do not know is that live petroleum fuel lines also parallel these tracks, laid down during Mr Anschutz's time as well. Mr Anschutz later served on the boards of the American Petroleum Institute, in Washington, D.C. and the National Petroleum Council in Washington, D.C.
** Also note that, with the merger of the Southern Pacific and Union Pacific Corporation in September 1996, Anschutz became Vice-Chairman of Union Pacific. Prior to the merger, he was a Director of Southern Pacific from June 1988 to September 1996, and Non-Executive Chairman of Southern Pacific from 1993 to September 1996. 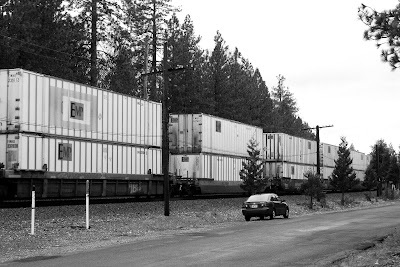 Earlier, I wrote about double-stack container traffic having been opened up over Donner Pass this past November. That was significant insofar as Union Pacific, if it wanted to move double-stack traffic east/west, had to do so through the Feather River Canyon route -- former Western Pacific territory (UP bought WP back in 1983). This canyon path is roughly 75 miles and three hours longer than the Donner Pass route. 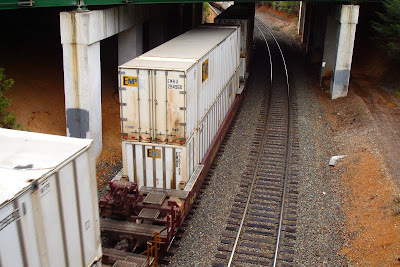 Because of height clearance problems, Union Pacific, in order to enable the taller double-stack cars, had to either cut up into tunnels or cut down into tunnel beds. Because some sidings were also increased on Donner, UP can run up to 9,000-foot trains here, as opposed to the 5,700-foot limitation through the Feather River Canyon due to siding length. 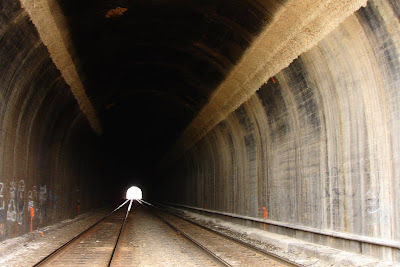 Recently I drove to Tunnel 18, which is located near Newcastle and directly adjacent Interstate 80. Below Auburn and at about the 945' level, Newcastle is where the double track splits just east of Tunnel 18 itself. West of Tunnel 18 is the Newcastle trestle which passes directly over I-80. 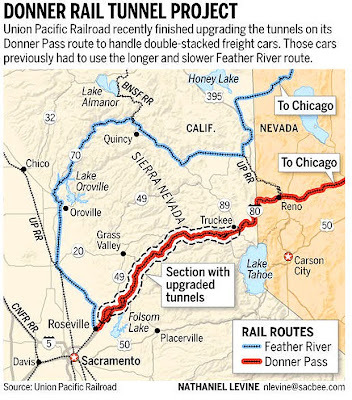 Having accessed this article in The Sacramento Bee last year regarding UP's tunnel work, I drove to the area for my own photographic purposes. As you can see, work crews made radial cuts in the upper portions of the tunnel concrete. In the top photograph, you can also see that the cuts on the upper right portion portion of the tunnel are deeper and wider, because the track is closer to the wall. In that photograph, taken looking east, the westbound #1 track is on the right, and the eastbound #2 track is on the left. After the snows clear I'll attempt to acquire more photographs of altered tunnels in the higher elevations.